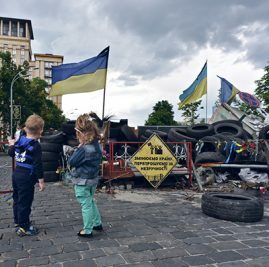 Despite persecution, evangelicals are seeing significant fruit in the middle of Ukraine’s bitter conflict. Aaron*, a long-term missionary in Ukraine, knew of a young evangelical believer who was driving a bus back and forth between Ukraine’s war zone to help evacuate women and children. One day DNR fighters (Donetsk People’s Republic, a Russian-backed separatist group) boarded the bus and took over. The first question they asked the young man was whether or not he was a Baptist. Christians, evangelical and Protestant, are facing persecution in Ukraine’s ongoing conflict. Among more than a million Ukrainians leaving conflict zones are evangelicals who were facing persecution. Evangelical and Protestant pastors have been abducted and even murdered, church buildings have been taken over by rebel fighters either to be used as base camps or torched, and Christians continue to be harassed and prevented from helping others. Chris*, a Ukrainian church leader, said Christians used to bring food and supplies to various orphanages, schools and hospitals, but are no longer allowed to do so. They are not allowed to evangelize, and Ukrainian pastors are not allowed into the war zone to provide help. “The [separatist leaders] resemble the Soviet powers more and more in their demands,” the church leader said. Christians also present a threat to Russians who believe any faith other than Russian Orthodoxy threatens the Russian identity. Despite these challenges, many more are coming to know Christ. Chris said one of their churches in the war zone was able to purchase washing machines, and they invite the neighborhood to use them as a way to help and reach out to unbelievers. The pastors and other Christians who have left the war zone are starting new church plants all over the country. They’re evangelizing, and more people are receptive to the gospel than before. “A couple of times I’ve either myself witnessed or been a part of witnessing to people from other parts of Ukraine … and it’s great because you’re telling them about Christ, and then at the end, they thank you for telling them. And that’s an openness that we didn’t even experience before the war when Ukraine was experiencing somewhat of a recovery economically,” Aaron said. He said he has seen many new people come to Christ at the local church he attends, which was started by a pastor who was forced to leave the war zone. The pastor began a social outreach to IDPs (internally displaced persons), and for nearly two months, no one came to know Christ–until recently. In a few short weeks, more than 10 people confessed their sin, the church baptized 15 believers and plans to baptize 25 more this summer, and more than 150 people are now attending the church. “That is phenomenal growth for a church plant anywhere in Europe, including Ukraine. That probably would not have happened had it not been for the war,” he said. Many of the churches that were started after the war have ministries specifically designed to help IDPs and bring humanitarian aid to the towns bordering the war zone. Aaron said he met a Crimean Tatar, religiously Muslim, whose relative was housed in a Christian church in the western part of the country because the relative needed help. 1.) Pray for people’s hearts continually being open to hearing the gospel and receiving Jesus Christ as Lord and Savior. “We see God at work through all of this. We know He uses difficult situations to wake people up and teach them to depend on Him. We pray that this situation would accomplish just that in the lives of the people affected by the tragedy, uncertainty, frustration, fear, and seeming hopelessness of the current political situation,” said Kerri and Jason Gupta. 2.) Pray for the safety of the pastors and Christians in the war zone. “Pray for the pastors that remain, for their safety and for God to do amazing things through them,” said Bryan. 3.) Pray the churches seize the opportunity to reach out. 4.) Pray the war/frozen conflict would end and for people to get their lives and jobs back and for their needs to be helped. 5.) Pray God would send more people to help the Ukrainian people in this dire situation.